Jurox Lectade Liquid Concentrate 250ml contains a balanced mixture of glucose, glycine, and electrolytes. It is the ideal rehydration therapy for dogs and cats. Lectade liquid rehydration therapy for dogs and cats contains a balanced mixture of glucose, glycine and electrolytes. Glucose and glycine are actively absorbed by the intestinal tract causing water and sodium to be absorbed simultaneously with these nutrients, ensuring a high degree of rehydration in scouring and dehydrated dogs and cats. 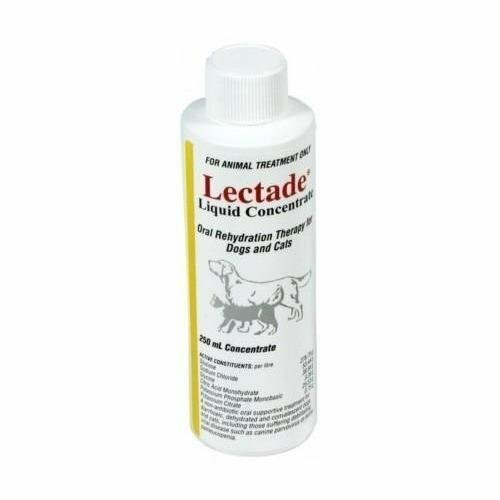 Lectade Liquid for dogs and cats is a proven fast acting rehydration product. Fast, Effective, Easy and Safe application/treatment. Lectade Solution can be used as the sole source of fluids during treatment. Dilute 1 part concentrate with 11.5 parts water and give orally, following specific treatment for the condition indicated. Most dogs find Lectade palatable and will drink it voluntarily. Palatability for cats is variable. Continue treatment for 1 to 2 days after the animal appears clinically recovered and is feeding normally.